This installment of the chronicle of the gatekeepers campaign serial clocks in at 10 pages, 1 page front cover, 1 page editorial, 1 page SRD, 1 page back cover, 1/2 page advertisement, leaving us with 5.5 pages of content, so let’s take a look! Okay, only GMs around? There is something odd, about similarities between worlds when you think about it: From dominant races to linguistic similarities, there are parallels in spite of vastly diverging cultures. I mean, oddly, PCs had not much acclimation issues on NeoExodus, right? Well, Large-Biter needs the PCs to verify something – namely whether the activation of the Nexus Gateway that brought them here was a fluke – and hey, if they’re stranded on the other side, at least they’re home, right? Pretty neat: If the PCs have played In His Bad Books, they’ll have an easier time activating the portal – which, btw., turns out to be a Stargate-esque task of activating different dials to properly calibrate the portal. 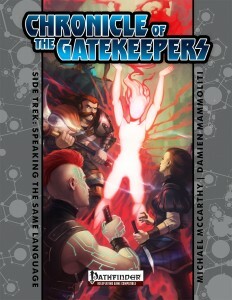 Michael McCarthy and Louis Porter Jr.’s Speaking the Same Language is an inspiring sidetrek: Much like the previous installment, it has a unique, creative central premise, here the activation of the gateway. This premise of gate activation alone is imho worth the asking price and can easily be scavenged for similar planar portals and gateways. The emphasis on intelligence-gathering and some truly intriguing repercussions from the knowledge gained also render this brief module more fun that one would expect from its brevity. Finally, the extremely challenging final encounter is a nice reminder of the things that lurk out there and the fact that sometimes, escape may be the smartest move. All in all, a damn cool sidetrek and well worth 5 stars + seal of approval. You can get this cool sidetrek here on OBS!